We get a lot of questions asking about what kind of anvil these are, who made them and what they are worth. They are found in great variety. While they are anvil shaped they are not true anvils. They are parts of other devices, bodies of vises, pieces of hobby tool kits. Due to their mass and anvil shape they survive while the rest of the device is long lost. They made of cast iron, relatively soft, weak and light weight due to being hollow. A few were made by known tool companies, most were made by foundries for inventors who thought they would conquer the world. Their value is mostly as curios unless the object they are part of is complete, then they are collector's items. Generally these are the worst of the "multi-tools" that try to do everything and do none well. They were designed for hobbiests or do-it-yourselfer's that had no room (or budget) for individual tools nor a need for good durable efficient tools. Even the best of the multi-tools such as the Shop-Smith always present the problem that while doing one operation you needed them for another, such as while drilling you needed to setup as a grinder to sharper a bit. 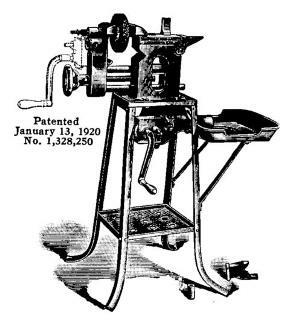 TOP: The patent 1894 "anvil" above is the back jaw of a vise with pipe jaws. The slot on the bottom fits a track that it clamped down on. Probably cast iron with chilled work surfaces. Maker unknown. All-In-One or Multi-Tool devices varied in complexity and use. Some like this were universal blacksmithing setups, others just combination tools with vise, drill press and a small light duty "anvil" for riveting, wire working and sheet metal work. Today popular multi-tools include the Swiss Army knife, Leatherman, the Smithy line and Shop-Smith. Champion Blower and Forge Co. This multi-tool was equiped with forge, vise, anvil, drill press, and grinding wheel. 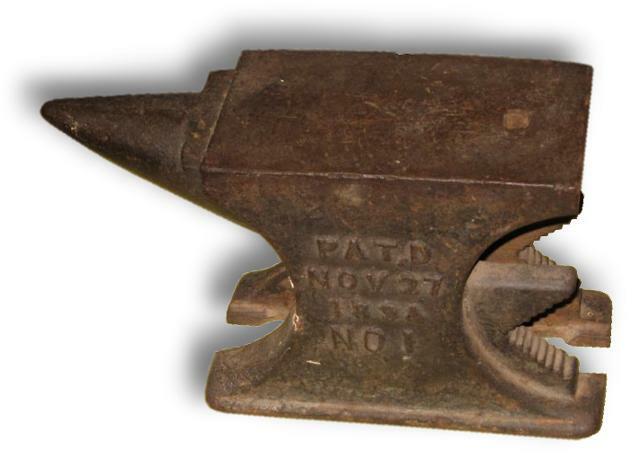 While it was advertised as "high grade" the anvil/vise was cast iron with chilled (hardened) faces. 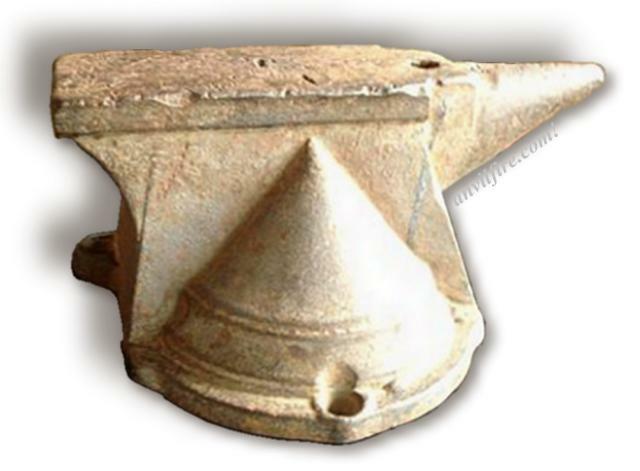 This was the lowest quality of anvil manufacturing of the time and was generally relegated to hobby and light bench work anvils, never for forging. 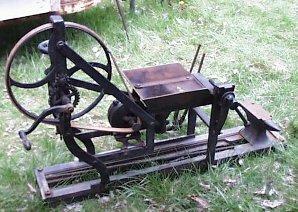 An interesting feature of this tool was the gear box which was moved from the forge blower to the grinder and drill positions. Champion Combination Outfit details . .
Another multi-tool anvil. The conical shape is purely decorative and appears architectural. White Multi-Tool Anvil details . .
Vises with anvil surface bodies and the horn as screw cover are common. 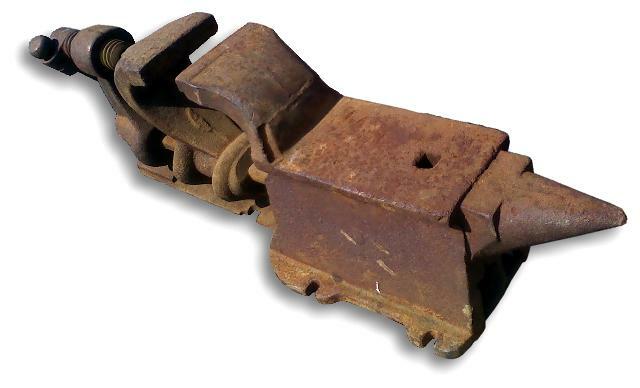 This one is more anvil-like due to being part of another unknown multi-tool device.